Joshua's school has the great program for sharing books. It is to encourage parents to read with their kids. For a week at a time, your child receives a bag to take home containing a book and sometimes some props to accompany the story. This week Joshua was given the "Sharing" bag. His bag contained the book Sharing a Shell by Julia Donaldson (the author of the Gruffalo, which we really enjoy). The bag also included a real sea shell and a little toy crab. This book is written in the sing-song rhyme style of Donaldson's other books, which is very fun and develops language skills for kids. The art work is colorful and quickly engaged my children (ages 4 and 2). But it is the story that really grabbed me. A sad little hermit crab quickly needs a new home to protect him from the seagulls. No one will help him or share, but finally he spots an empty shell. Through no act of his own, he ends up sharing his shell with two unlikely friends - a purple anemone and a yellow bristle-worm. As they help each other through challenging situations, they learn lessons of friendship, sharing, forgiveness and peace-making. I love this little story and the lessons it teaches kids. We had to return the book to school today, but it is one we will be investing in soon. I was even more excited about this book when I heard Joshua talking about sharing something with his sister "just like the Sharing Shell," he said. Beautiful! Sharing is something that both my kids need to work on. Thanks for a useful book suggestion. This looks like a really sweet book. I am all for books with good lessons in them. Thanks for the suggestion. Sharing is something my 4 y.o. could use some (lots of) help with, thanks for the recommendation, I'll look for it at the library. Oy yes we need all the books about sharing around here! :) That's a great program. I've never heard of one like that! Thanks! I've added this to my list. My kids are into anything ocean related and a sharing theme is just an added bonus! 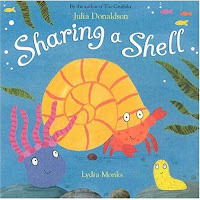 My older kiddo recently brought Sharing a Shell home from the library and we really enjoyed it. We already have an awful lot of Julia Donaldson in our bookshelves here at home, truth be told. She really has a way with rhymes! This book sounds so neat! I'll see if my library has it this weekend! Thanks for sending me the link.